DAVIS, Calif. (KTVU) – In the image, she’s wearing a royal blue gown, carrying a black-striped American flag with a thin blue line streaked across it. Her heels are high. Her hair is done. Her smile is beaming. And she’s standing in the middle of Leesville Grade Road next to a field in Williams, Colusa County, population 21,000, in California’s Central Valley, where her father was a sheriff’s deputy and now a county supervisor. 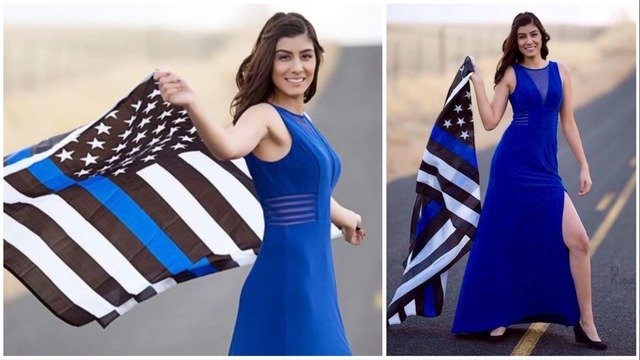 It’s this compelling photograph of slain Davis police officer Natalie Corona that circulated throughout the country on Friday, hours after the 22-year-old was shot to death by a suspect identified on Saturday as Kevin Douglas Limbaugh, 48. A note found on his bed inside his home,where he later killed himself, stated that he believed Davis police bombarded him with ultrasonic waves. The Sacramento Bee reported that court documents show he was convicted in a battery case and agreed in November to surrender a semiautomatic rifle. Witnesses said he seemed to shoot randomly into the scene on Thursday evening in Davis, about an hour away from where her photograph was taken, and then walk calmly away. He was found a few blocks away at his home; he died of a self-inflicted gunshot wound to the head. Two semi-automatic handguns were found, too, police said. “I would like this photograph to serve as my gratitude for all those law enforcement men and women who have served, who are currently serving, and those who have died in the line of duty protecting our liberties in this great country,” Corona wrote on her Facebook page on Oct. 21, 2016. She used the hashtags: #LawEnforcement #Blueline #Thankyou#Lausphotography. The words are almost prescient, written more than two and a half years before her death. Authorities say Limbaugh walked up to a traffic accident that Corona was called to and started shooting at her patrol car, a fire truck and a minivan. She was struck by the gunfire and died later at the hospital. It’s unclear if the two had ever met. Photographer Rich Lau told KTVU on Saturday that he remembers Corona, and the day of the photo shoot, well. A few years ago, before she became an officer, she used to sell fruit at a stand that he frequented. They struck up a conversation. He is a portrait photographer who needed models to practice with and “she was really photogenic,” he said. So they arranged a day to take photographs. “She chose the outfit, she chose the flag,” Lau said. He didn’t ask too many more questions, and made images of her holding the flag, which symbolizes police officers who are courageous when faced with unbelievable odds. Over the next couple of years, Lau said he has taken many more photographs of Corona, which he said he wants to send to her family and not be shared publicly unless they want to. Corona was the first officer in the Davis Police Department to die in the line of duty since 1959. She had only been patrolling solo for about two weeks, the chief said. But friends and family say becoming a police officer was all she had ever dreamed of. “I don’t remember her talking about anything else than wanting to become an officer,” said Emily Gomez, who said her cousin was an athletic star in high school, excelling in volleyball, basketball and track. She grew up in a tight-knit family in the Northern California town of Arbuckle. The family had emigrated from Mexico a few generations ago and had become established members of their community. The Associated Press contributed to this report. This story was reported in Oakland, Calif. This story was updated on Jan. 14, 2019 to correct the misspelling of the photographer’s name and to add information about a letter left on the suspect’s bed.